Vancouver, BC: A five month investigation led by the Combined Forces Special Enforcement Unit – British Columbia (CFSEU-BC) and involving law enforcement partners from both sides of the border, has successfully shut down an illegal drug tunnel built between BC and Washington State. Three individuals have been arrested. The investigation began in February 2005 as a result of great initial work by Canada Border Services Agency (CBSA) in following up on a suspicious border activity. The information was forwarded to CFSEU-BC and the investigation soon expanded to include the RCMP Border Integrity Program, and the US Drug Enforcement Administration (DEA), US Immigration and Customs Enforcement (ICE) in the United States. This intelligence-led investigation focused on a group of suspects that were planning to construct an underground tunnel between a property in Langley, British Columbia and Lynden, Washington to illegally move drugs. 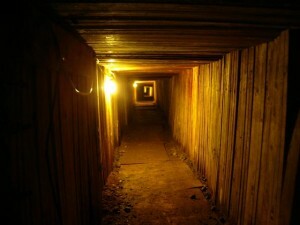 Investigators monitored activity on both sides of the border and confirmed that plans were underway to create such a tunnel. The investigation has tracked the progression of the tunnel over the last several months and allowed its completion in order to track those responsible for its creation and the possible use. Within the last few days the sophisticated tunnel was completed. It is approximately 3 metres (10 feet) deep and 110-metres (360 feet) long. 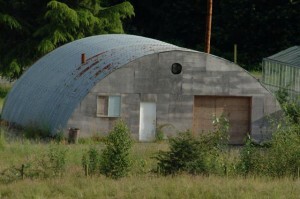 The suspects would access the tunnel through a 4×4 foot opening hidden in a Quonset outbuilding on a property in 26000 block of Zero Avenue, Langley and it runs to an outbuilding in Lynden, Washington State approximately 91 metres (100 yards) away. It was constructed using various digging equipment including shovels, a winch and carting system to remove the dirt. 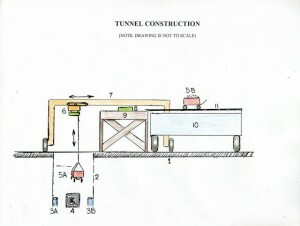 The tunnel walls are reinforced with concrete, metal re-bar and 2×6 wood supports. It is not very wide and a person going through it would have to crouch down or even crawl to get through. Arrested on Wednesday July 20, 2005 in Lynden, Washington and charged with Conspiracy to Distribute Marijuana, and Conspiracy to Import Marijuana in U.S. District Court in Seattle are Francis Devandra RAJ, 30, Timothy WOO, 34, and Johnathan VALENZUELA 27, all of Surrey, BC. Approximately 200 pounds of marijuana has been seized to date. The investigation remains active and ongoing. A number of search warrants are being executed in connection with this drug investigation. The arrests and seizures are the result of a coordinated investigation and enforcement plan on both sides of the border that tracked all movements associated with the illegal tunnel and its use to smuggle drugs between Canada and the US. Investigators would like to stress that all activities associated with the illegal tunnel were the subject of this investigation. We are confident the arrests and charges, and destruction of the tunnel have effectively shut down this illegal operation. At no point during this investigation was the safety of the public at risk or the integrity of the highway for Zero Avenue compromised. This illegal tunnel was an ambitious and sophisticated endeavour and now it has been shut down and secured. CFSEU-BC would like to thank all the agencies involved for their assistance on this investigation. This case exemplifies how Canadian and American authorities are working together to combat organized crime in keeping both our countries safe and secure.